A hike through the Cadillac Heritage Nature Study Area can be a bit of a surprise for many first-time visitors. Depending on the time of year, the wildlife seen along the trails can surprisingly abundant. And that’s surprising because the 235-acre preserve is practically in the middle of Cadillac. At one point along the trail you’re looking at the backside of a Days Inn or reading billboards and listening to the traffic along M-115. Yet in the middle of this marsh it’s possible to see hundreds of turtles, small flocks of ducks, an osprey's nest, great blue herons taking or a beaver slapping its tail as it swims past an observation deck. The water source for the marsh is Black Creek, which was originally used by lumbermen to move logs between the two large lakes. But it was a difficult task moving logs along the shallow and winding river, and in 1873 the loggers built the present canal between Lakes Cadillac and Mitchell. In 1973 the DNR constructed a dike around the Heritage area and for a few years used it as a pike-rearing pond before more cost-effective hatcheries were developed. Finally, in 1979 the wetlands were formally dedicated as a nature study area. They are a pleasant contrast to the often busy state park campground. Accessed from the Carl T. Johnson Hunting and Fishing Center and part of William Mitchell State Park, the nature study area contains almost 3 miles of trails that enclose a 70- acre marsh. Black Creek flows through the wetland on its way from Lake Cadillac to Lake Mitchell, making it especially attractive to waterfowl and other water birds that frequent the large lakes. Hikers have the opportunity to spot mallards, wood ducks, black ducks, and Canada geese during spring and fall migration, plus herons, bitterns, shorebirds, and other wetland-related bird species. Songbirds that nest in the wetland and adjacent habitats include the redwing blackbird, common yellowthroat, yellow warblers and goldfinches while barred owls, red-tailed hawks, and occasionally osprey and bald eagles are observed here. Deer, beavers, muskrats, raccoons, and turtles are common throughout the area. 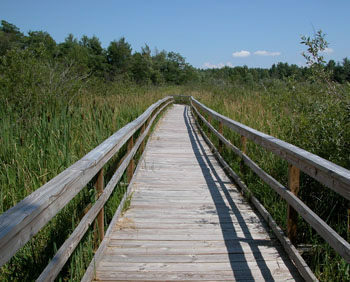 From the Johnson Center, the trail heads north as a half-mile spur that provides access to a nearly 2-mile loop of dikes encircling the marsh. Following the dike along the perimeter of study area is a 2.8-mile round-trip hike from the interpretive center trailhead. The hike described below is a 2.6-mile outing that includes the most interesting section, the spur across the wetland between posts No. 7 and No. 9. The trail is not open mountain bikes but does feature a dozen interpretive panels, making it an excellent outing for families. A pair of high powered binoculars are handy here as there are several places along the trail to sit and search the marsh for wildlife. It's also better to hike the trail in the evening, even if it means arriving after the interpretive center is closed. What you encounter alive in the marsh is much more interesting than what's been mounted on the walls at the Hunting and Fishing Center. Post. No. 1 is the main trailhead and is located southeast of the interpretive center and it’s large parking lot. The trail begins as a gravel path in the woods, first in a beech forest and then as a long boardwalk through a cedar swamp. At Mile 0.6 you reach post No. 4, on Black Creek and at the edge of the large marsh. Cross the bridge to post No. 10, marking the return of the loop, and head west (left). On one side of the dike there is the open water of Black Creek, on the other is the cattail-clogged marsh itself. Within 100 yards you reach the spur to the observation tower. From top of the tower there is a view of a sea of cattails but no open water. Past the spur the main trail skirts the creek, passing a fishing deck at Mile 1 and then swinging north. Post No. 7 pops up at Mile 1.46 and marks the west end of the spur across the marsh. Head east (right) and you’ll immediately leave the open marsh and sun behind for the shaded world of a small stand of pines, an “island” of eastern hemlock in the middle of a wetland. The marsh returns and a long boardwalk leads you to post No. 9 on the main trail at Mile 1.76. Head left briefly if you want to check out the osprey platform to see if any birds are nesting. Head right and a wildlife blind, overlooking a small patch of open water, is reached at Mile 2. Within 200 yards the main trail reaches post No. 10 near the bridge over Black Creek. A vault toilet is located here along with a spur that heads east to Kenwood Heritage Park. Re-cross the bridge to return the Hunting and Fishing Center at Mile 2.6. 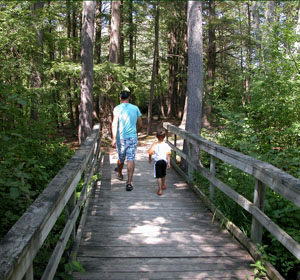 The 334-acre Mitchell State Park includes 221 modern sites within a semi-wooded area that is well shaded by hardwoods. 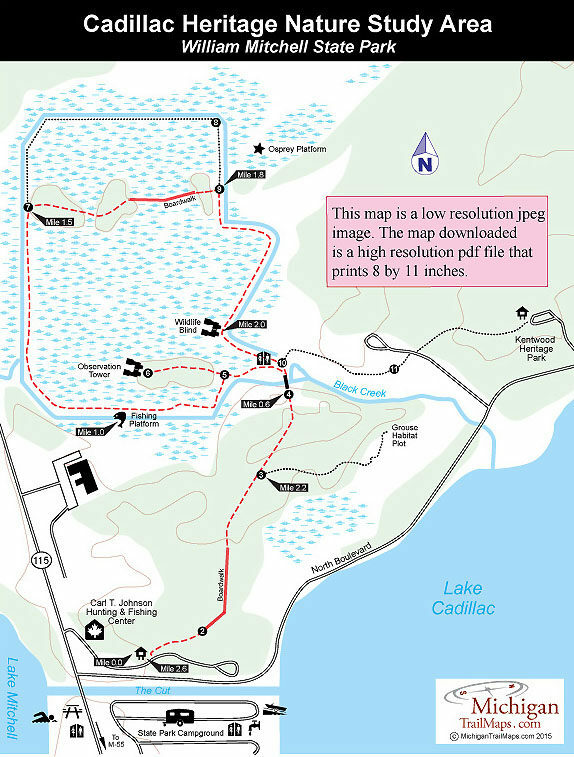 The campground includes 24 pull-through sites specially designed for large recreational vehicles and a Mini-Cabin that overlooks Lake Cadillac. But the most popular sites are those that line the canal where boats can be docked right next to tents or trailers. The state park also maintains a day-use area on Lake Mitchell with a separate entrance and parking lot from the campground. Along with the sandy beach and designated swimming area, facilities include bathhouse, picnic tables, grills and a shelter. Dedicated to the long tradition of hunting and fishing in Michigan, Carl T. Johnson Center is barrier-free and features numerous fish and wildlife displays, interactive kiosks and multi-media presentations. Also inside are restrooms while outside is an archery and pellet gun range. The Carl T. Johnson Center is open from 10 a.m. to 6 p.m. Monday through Saturday and noon to 6 p.m. on Sunday from Memorial Day to Labor Day. In the winter call for times. A state park passport sticker or daily vehicle permit is required at the center. The Carl T. Johnson Hunting and Fishing Center is 2.5 miles west of downtown Cadillac on M-115 with an entrance just north of the Mitchell State Park campground. 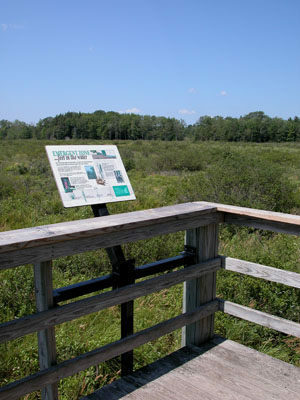 The Cadillac Heritage Nature Study Area is also accessible by following North Boulevard east from M-115. Just after crossing Black River, you can turn left onto Rose Street or at Kenwood Heritage Park to reach trailheads and parking. Call the Carl T. Johnson Hunting and Fishing Center (231-779-1321) or Mitchell State Park (231-775-7911).